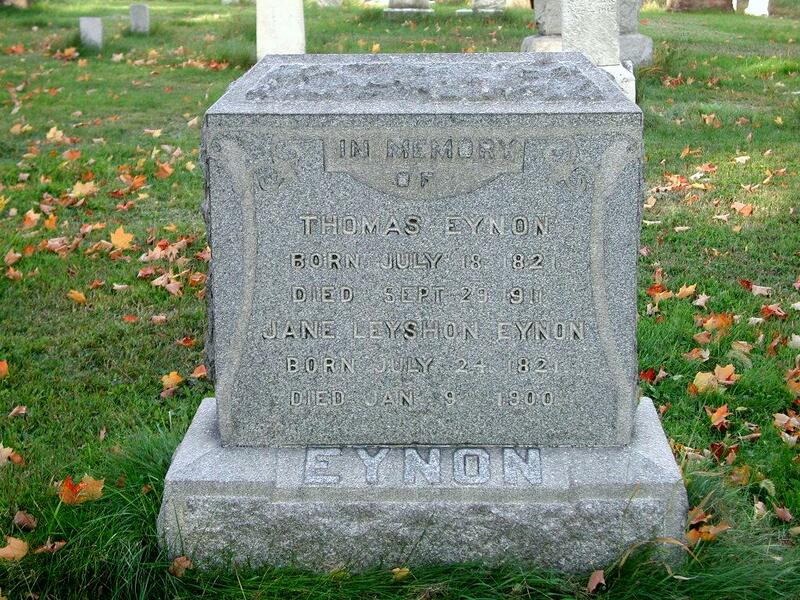 Thomas J. Eynon (1821-1911) was born in Wales and eventually settled in Hyde Park/Scranton, Pennsylvania in the mid-19th century. During his lifetime Eynon exerted great influence over his community and was regarded as one of Hyde Park's leading citizens. A successful businessman, he helped found the influential Welsh Philosophical Society, along with his friend and contemporary Benjamin Hughes, a group that first met in a room above Eynon's grocery store in Hyde Park. The Eynon and Hughes families enjoyed a long relationship, which was cemented in part by the marriage of Eynon's son Albert (A.B.) to Hughes' daughter Annie. Like Benjamin Hughes, we know that Thomas Eynon was acquainted with my great-great grandfather, John J. Thomas of Brynmawr, Wales and Scranton, Pa., because he was present at and signed his name on my ancestor's naturalization papers of 1851 and 1854. In addition, in 1864 Eynon sold John J. Thomas a plot of land on North Hyde Park Avenue that was to become the Thomas family homestead. It should be mentioned that Eynon also served as a witness at Benjamin Hughes' naturalization proceedings in 1851 and 1854, both of which occurred on the same two days as my own ancestor's proceedings. The biography on Eynon found below is taken from a book titled, Portrait and Biographical Record of Lackawanna County, Pennsylvania, Chapman Publishing Co., New York, 1897, which provides further details about the life and times of one of Scranton's best-known and most respected 19th-century Welshmen. Through the course of a long life and in the development of the various industries which he has been connected, Mr. Eynon has won and maintained a reputation for honesty, energy and perseverance. He is partner in the firm of G. F. Eynon & Co., proprietors of a general store at No. 105 North Main Avenue, Scranton, and is well known in business circles of this city. The fact that he has risen from a humble position in youth to rank among the well-to-do residents of the city, adds another striking illustration of the power of determined purpose. Mr. Eynon was born in Wales July 18, 1821, and in 1832 accompanied his father, John Eynon, to Canada, but the following year came to the United States, settling in Pottsville, Pa. When fifteen years of age he began to work at the carpenter's trade and this he followed continuously for ten years. From Pottsville he removed to Carbondale, where eight years were spent, and in 1850 he came to Scranton. Here he assisted in opening the Diamond mines and worked at mining for two years, after which for three years he engaged in trade. Afterward, for four years, he was foreman of the Hampton mines. From mining and carpentering Mr. Eynon turned his attention to the mercantile business and opened a store on the corner of Main Avenue and Scranton Street, Scranton, where he carried on a profitable trade for six years. On closing out the business, he went to Summit Hill and was foreman in mines there for three years. He held a similar position in Irondale, Ohio, and later had a mercantile store in Alliance, Ohio, for four years. Going from there to Steubenville, the same state, he erected a rolling mill and remained two years in that place. Since his return to Scranton he has been engaged, first in merchandising, then for fifteen years as foreman of the Diamond mines, and since 1893 as a member of the firm of G. F. Eynon & Co. He makes his home at No. 322 South Main Avenue. In 1840 Mr. Eynon married Miss Jane Leyshon, who was born in Wales, but has spent her life principally in America. Seven children were born to them, of whom three are living. Albert B., who is cashier of the West Side Bank, is one of the expert financiers of Scranton and is recognized as one of the ablest men of the city. George F. is a successful business man and carries on the general store in which his father owns an interest. Jennie is the wife of Dr. B. G. Beddoe of Hyde Park. During the late war Mr. Eynon was treasurer of the Hyde Park borough. He is a man who maintains a keen interest in all public matters and favors schemes for the promotion of the welfare of the people. He is a member of Plymouth Church and contributor to its maintenance, as well as to the carrying forward of philanthropic plans. The Welsh citizens of Scranton have in him an able representative, and he is an honor both to the land of his birth and the home of his adoption. Below: Cemetery marker of Thomas Eynon and his wife Jane, Washburn Street Cemetery, Hyde Park/Scranton, Lackawanna Co., Pa.